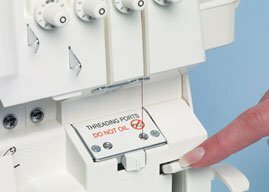 Exclusive Jet-Air Threading™ ~ Threading a serger has never been easier than with the revolutionary Jet-Air Threading from Baby Lock. With just one touch of a lever, thread is sent through the tubular loopers. 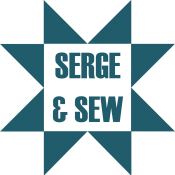 There are no thread guides, no struggling, and there’s plenty of extra time to serge away! Full-Featured, Differential Feed ~ Baby Lock took the differential feed mechanism to a new level by adding a single unit feed dog mechanism. This ensures stronger feeding as well as more consistent gathering on all fabrics. 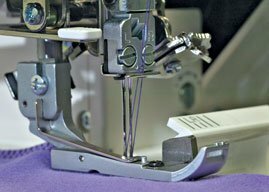 Vertical Needle Penetration ~ While most machines use slanted needles that push and damage fabric, Baby Lock's needles are set vertically and sew directly up and down. 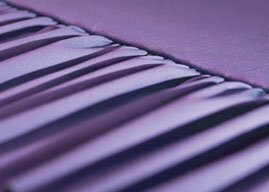 This exclusive feature protects your fabric and prevents needle defection.